Interesting Find Interlude: What is This? A good friend, Wintery Knight, recently posted the following on his excellent blog. I was going to save it for an activity series I plan to post on soon, but thought it was too interesting to sit on for so long. Take a look at the picture to the left with your kids. No peeking at the answer until you’ve come up with your own thoughts to the question above! 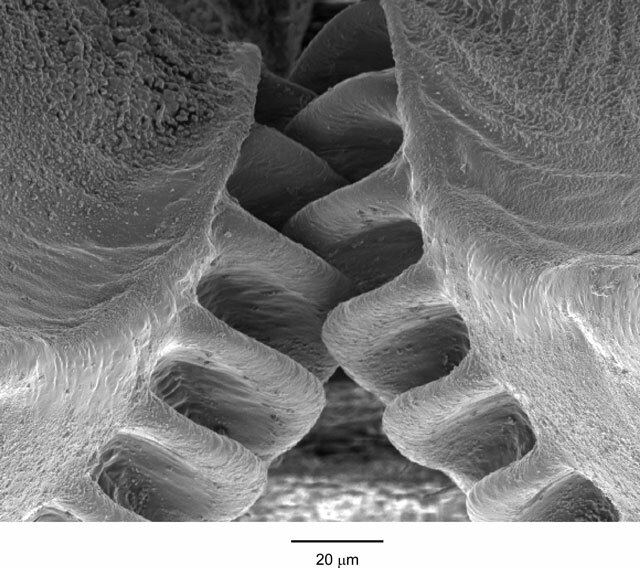 And the answer is … this is a picture of microscopic gears that are inside the body of an ‘issus’, which is a kind of planthopper insect! These gears are located at the top of the adolescent issus’ legs and help it to jump. It takes the issus 2 milliseconds (faster than a blink) to engage these gears and jump skyward at a rate of nearly 400 g’s (or 20 times faster than the speed a human body could withstand). The issus is less than 1/10th of an inch long but can jump up to a speed of 8 mph! And for some reason the issus only has these gears in adolescence. They change into a more typical mechanism for jumping once the issus is an adult. Notice the word “built” in the quote. Something like this screams of design inside the body of the issus! Read Wintery Knight’s summary of the article for more details. If our Christian faith is true and the God of the Bible really does exist, then we should find His fingerprints all over the universe and the life He created. These mechanical gears inside the issus are one demonstration of that. They cannot be explained away by evolution. We see things that we recognize buried deep inside creation – in this case gears that look similar to the ones you’d see in a human-built machine. I’ll talk more about this kind of thing in the future when I post a series called “Finding the Fingerprints of God.” Our kids found this kind of information really interesting and it gave them a different glimpse of God. ← Why Aren’t the Gospel Accounts Identical to Each Other? Also look at this – isn’t our Creator amazing?